The reason I started bookbinding was to make journal books with paper known to take fountain pen ink without feathering or bleeding through to the other side. Good journal books are also expensive, and if I'm making them myself I won't feel like I need be careful about how much I write. I think the biggest trick will be getting a spine that is flexible enough that I can open the book all the way without cracking it. The first step is to make the endpapers. I made zig zag endpapers using the same methods shown in my last project. This time I will be sewing a complete section inside the zig zag fold. I'm not sure how well this will work, but it should make all the sections the same thickness and will hopefull make the sewing more even. In my previous project I pulled too hard on the thread when sewing up the last endpapers and because it was only two pieces of paper thick, it tore slightly. After the endpapers have dried and been folded, I folded up eight sections made from six pieces of paper. Since the endpapers already have one sheet, I only folded five sheets inside them. That will yield a book with 96 sheets or 192 pages. After doing all the folding, I lined up the sections and pressed them in my lying press. Note that I folded the endpapers and then put the five sheets of folded paper inside. I should have folded the endpapers and the five sheets that go inside at the same time to insure the fold is in the right place. As it was I had to do quite a bit of fiddling around to get the five sheets to fit inside. When it came time to mark the sections for piercing and sewing it was clear that putting five folded sheets inside the endpapers wasn't going to work because they weren't all folded together. I decided to remove three pages from each endpaper section to form a seventh six-page section, leaving two folded sheets inside each endpaper. That worked a bit better, but it's obvious from comparing the ends of a section I folded up together and the mixed section I put together later that you really do need to fold all the pages together from the start. I followed the same procedures as I used in my previous project except this time I used 18/3 thread and three wider tapes. I also got to try my new plough iron to plough the fore edge of the book. You can see this process in the image on the left. I'm about halfway through the book at this point. In retrospect, I probably cut a bit too much off each page, but I was very excited that it worked so well. The rounding seemed more difficult that it was in my first book, and I think it was because I tied the kettle stitches tighter this time. I also couldn't get the book to sit low enough in the lying press when backing, which either means I need a stronger press, or that I should try using backing boards. But I think it all worked out well enough. For this project I'm using book board instead of doing a split cover with flexible red board and cerel box cardboard. I cut the boards using a retractable razor knife like you'd find in a hardware store. With a new blade, it cuts through the board with two passes. The boards are cut to the same width as the text block, but 5/16 inches taller than the paper. The boards will extend past the textblock by just over 1/8 of an inch, and the gap between the edge of the hollow back and the boards will form a French groove to allow the covers to open easily. I think this is more important when you're covering the book with a thick material like leather, but I'll be using book cloth for this project. One trick I discovered is to draw 45 degree diagonal lines from the outside corners of the insides of the covers, and then draw a straight line down the outside edge about 1/8 of an inch in. When you're pasting the boards to the flange (holding the tapes and mull), you just line up the corners of the text block on the diagonal lines, and then make sure that the fore edge of the pages is parallel to the line running down the edge of the cover. It makes it really easy to get everything lined up correctly. Before putting the book in the press, sight down the top, bottom and fore edges to confirm that the two covers are lining up correctly. This book was covered with the same book cloth I used on the last book. I'm getting better at turning the top and bottom over, but I haven't figured out how to do this without getting pigmented glue on the top and bottom edges of the text block. I used a pair of knitting needles to help form the French groove. Because they're so long, it's easy to paste down the spine, wrap the cloth around the spine and over the boards, and then use the knitting needles in the grooves to hold the book while smoothing cloth on the front and back covers. 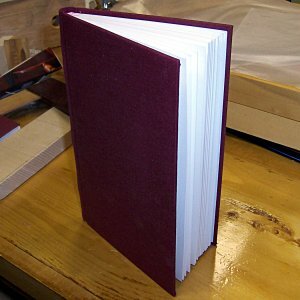 Make sure all the pages are folded together into signatures or endpapers. I tried inserting some folded pages into the zig zag of an already folded endpaper and it doesn't work very well. Make sure the two pieces of paper that form the zig zag are pasted together very securely. Because of the tightness of the spine (see the next item), the front endpapers are beginning to seperate at the glue joint. Loosen up a bit when sewing one section to another. I don't know if it's the kettle stitches or the straight transitions stitches (or both), but rounding and backing isn't as even near the kettle stitches, and I think it's because they're too tight. Pay very close attention when lining up the sections for ploughing, and before the book is rounded and backed. I did the ploughing before I glued the spine, which may have been a mistake because the fore edge isn't even from signature to signature even though it's even within a signature. And in the rounding and backing the top and bottom edges got out of square. Now that the spine is fully dry, it's too late to fix it. 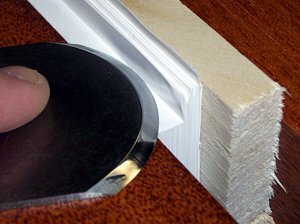 See if backing boards help keep the text block down in the lying press when doing the backing. I found that the book kept moving up out of the press during backing. It also might work to put a waste sheet on the outside of the book, and line the jaws with fine sandpaper turned away from the book. 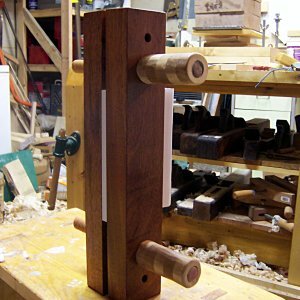 The sandpaper will grip the press and the paper will grip the sandpaper and the text block. Sight down the boards on the top, bottom and fore edge to confirm the boards are lined up with each other before pressing. Mine are a bit off on this project.